Yes the C word is around the corner. Coca Cola have aired their annual “Holidays are Coming”, Hellman’s Mayonnaise have shown their credit crunching been-showing-the-same-unremastered-ad-since-1980’s, households are beginning to compete as to who can rack up the biggest electricity bill with gaudy decorations and various z-list “celebrities” are battling out in the OZ jungle by eating various parts of a kangaroo’s anatomy. A great respite from all this was a trip to the Fabulous Places Christmas Market at Blackbrook House near Belper to discover some great Derbyshire independent businesses and people. I Spoke to Julie at Vintage & Cake about 50’s Swing Dresses, discussed gluten-free cooking with Charlotte from Cupcake Corner, debated the virtues of edible glitter with Wendy at Quirky Cookies, picked up some stunning parrot tulips and anemones from Kerry at The Blossom Tree and finally Claire from Things We Make. I’ve been chatting to these businesses via twitter so it was lovely to be able to put a face to a name. Another great business there was Jack Rabbits. They have a fab new little business opposite the Cathedral in Derby, sell gorgeous food and cook on an Aga…need I say more! I’ve been playing around with festive recipes for a while. Primarily for my Cookery Club Kids. Mince pies went out of the window as a straw poll of my Cookery Kids told me that kids don’t like mince pies, Christmas truffles not idea, (you wouldn’t believe how long it takes to melt 16 sets of chocolate of chocolate in the microwave!) even these festive muffins couldn’t tempt them away from Stained Glass Biscuits. Some of the children have made these biscuits before, but they still insisted in making them again. Kids are always amazed by the way the boiled sweet melts to make sugar glass. So given most of the Cookery Kids claim to not want to make these muffins due to the dried fruit in them these are for the adults to enjoy. 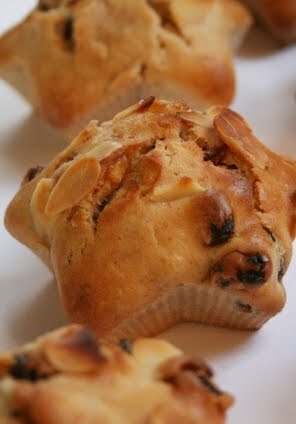 To make these muffins extra Christmassy I cooked them in my star moulds. I have to admit funky shaped silicone moulds don’t cook as evenly as traditional round moulds, but they still taste great. One thing I would say is don’t over mix as this mixture has a tendency to make dense heavy muffins if mixed too much. 2) In another bowl whisk together egg, milk and butter. Pour the liquid into the dry ingredients, stir until well combined. 3) Carefully stir in the dried fruit and spoon into cake cases into 2/3 full. Sprinkle with flaked almonds. Bake for 25-30 min until risen and golden. Ah, yes just noticed that. I couldn't leave you out though!The stained glass biscuits are great and look lovely hanging on the tree. Last time I made them with the Cookery Kids one of the girls experimented with different coloured sweets and managed to make great patterns with the sugar glass. They look great, love the different shapes. 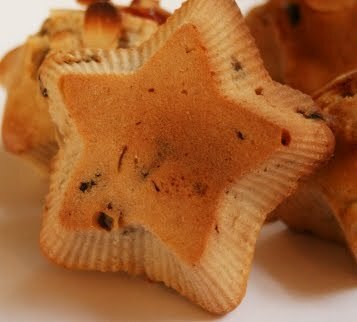 The star-shaped muffins are so cute! Might have to invest for our Christmas morning muffins. I've got some of these star moulds but not used them yet. Glad to see they work. Your cakes look a great shape and not crumbly at all. Lovely! Love the star moulds – totally adds to the festive fun. I love the star muffin tins! Where did you get them? We only have disposable ones here. I just purchase and used mini bundt cupcake pans and a square cupcake pins. People love them and I think they give desserts a little something extra. Jennifer – Thank you :)Katiecakes – if you make the stained glass biscuits, let me know how they go.Curious Cat – I love finding great producers local to me.TC – They certainly would be worth investing in.Sarah – I would almost go as far to say these have more of a bready texture.Libbs – sounds like a cracking idea!Chele – I should bake with them more.youngwifey – I got them from a baking company that no longer exists, but I have seen them on ebay amd local baking shops.